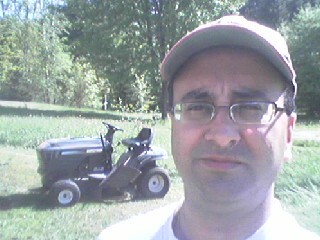 My riding lawn mower crapped out on me just when I needed it the most. It's been impossible to mow for at least two weeks due to the non-stop rain we've been getting. So, finally on the day we planned to leave for Toronto, it stopped raining and was bright and sunny. I left work a little early so I could get a head start on the mowing but after a couple of passes on the lawn, the steering rod broke and that was that for mowing! Damn! We left later for Toronto.